The name InterCellular has a special place in my heart as it was the first mobilephone network i used courtesy a hand me down flip phone. It was kind of sad to see it fold as CDMA networks succumbed to the might of the big GSM networks. But now InterCellular back from dead like the Phoenix with a name change too. The new company now goes by the name InterC and is rebranded as a 4G Internet Service Provider (ISP). At present, InterC 4G network only works in three cities (Abuja, Kaduna, Port Harcourt) although their plans for a rollout in Lagos and some other major cities. As part of their resurrection relaunch, InterC is offering would be customers free data as an incentive for every MiFi device purchase. 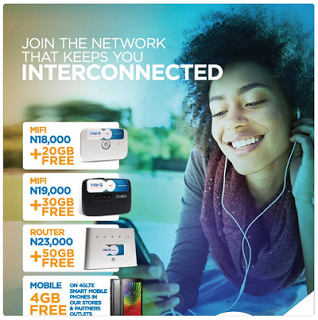 Customers who purchase their N18,000 MiFi would get free 20GB of data for free, those who purchase the N19,000 MiFi get 30GB ¯\_(ツ)_/¯, those who go all in and purcahse the router for N23,000 get 50GB free. Mobile phone users aren't left out as they too would be 4GB free data when they purchase a 4G LTE device from InterC stores.